If there’s a governor who can turn around one of the lowest-ranking states in education, it will have to be either Nevada Attorney General Adam Laxalt or Clark County Commission Chairman Steve Sisolak. Laxalt, 39, easily won the Republican primary Tuesday night with 71 percent of the vote, beating out state Treasurer Dan Schwartz. Nevada has had a Republican governor for the past two decades, but Democrats are hopeful they can elect one of their own after Hillary Clinton won the state vote in the 2016 election. However, polls show that Nevadans view their current Republican governor, Brian Sandoval, favorably, which could boost Laxalt’s chances at the polls. 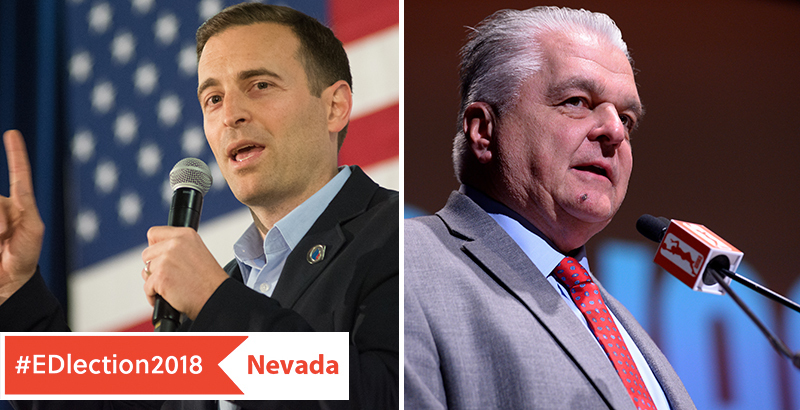 A poll was conducted in April that paired Laxalt and Sisolak as potential gubernatorial contenders; respondents selected Sisolak as the favorite to win by six points, according to The Nevada Independent. Education has remained a critical issue for both candidates in this election, especially regarding the state’s funding formula, which hasn’t been updated for 50 years, giving the state its 44th-place ranking in per-pupil spending. Nevada has ranked at the bottom of Education Week’s performance index for four of the past five years. While the state’s charter law remains strong, education savings accounts have failed to receive funding from the state legislature following a victory at the state’s supreme court. Laxalt has far less experience in education than Sisolak, who has overseen higher education from his seat on the state’s Board of Regents and has the endorsement of the local union. Although Laxalt won’t commit to keeping taxes that fund all of Gov. Sandoval’s programs in place, Laxalt’s spokesperson told The 74 that he won’t reduce current levels of education spending. Laxalt has said teachers should be able to be reimbursed for more of their classroom expenses and has voiced support for funding the state’s contentious education savings accounts. Sisolak supports boosting funding for education through additional taxes as well as increasing teacher salaries. Laxalt, on the other hand, received Trump’s support in a tweet on election day. Laxalt supported Trump in the 2016 election.